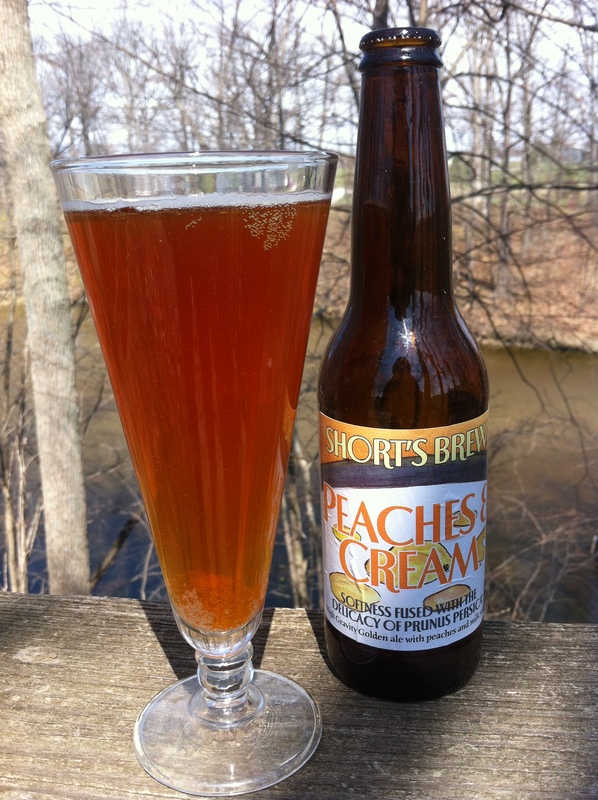 PEACHES & CREAM is a fruit beer from Michigan’s Short’s Brewing Company. They brewery calls it a Golden Ale, whereas Beer Advocate refers to it as a Fruit Beer. Regardless of the designation, this beer has a shockingly large 8.3% ABV and an equal surprisingly 43 IBUs. Peaches and Cream is a high gravity, golden ale, fermented with lactose and fresh peaches. 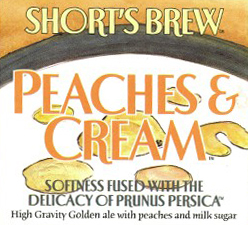 Joe Short used this eloquent bi-line to describe the beer’s flavor profile: “Cream softness fused with the delicacy of Prunus persica.” We used a half pound of real, fresh peaches and approximately 1.5 ounces of milk sugar for every gallon of beer produced. Considering I knew what peaches look like (I know, I’m a braggart), I figured I also knew what this beer would look like. Nope. I was wrong. It poured a lot darker than expected, almost a burnt orange color. The beer was thin though, which made the massive amounts of carbonation quite noticeable. The head was thin and bubbly, leaving behind only minor strings of lacing. Right from the get-go the aroma was a nose full of peaches. Lesser notes of strawberry (odd), custard, and cream were also present. And here’s where I tell my friend that he was not kidding about the sweetness of this beer. The taste was sweet. Like cloyingly sweet. It began with the expected dose of peaches, but there was an earthiness to it that was not expected. A malty cracker/pie crust flair hit in the middle and helped to subdue the sweetness a bit. It finished with a touch of stone fruit (apricot with a smidge of cherry) and some medicinal notes. Honestly the flavors were very hard to discern due to the sweetness overload that follows you through the entire glass. Mouthfeel is light, but very sticky and very sweet. Considering how “light” the body felt the beer itself was shockingly viscous, with tons of sugary residue left behind after each drink. Andrew, you were correct. This was a very sweet beer. This beer is so sweet in fact that it was hard to get anything out of it other than “sweetness”. The peaches, and especially the cream, had to take a backseat and ultimately so did my enjoyment.